No, kidding, well, not really! 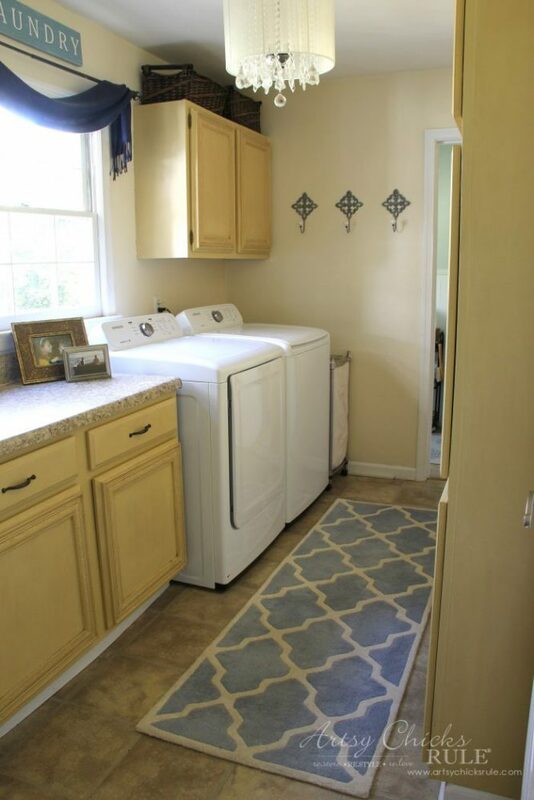 ….and makeover our laundry room. 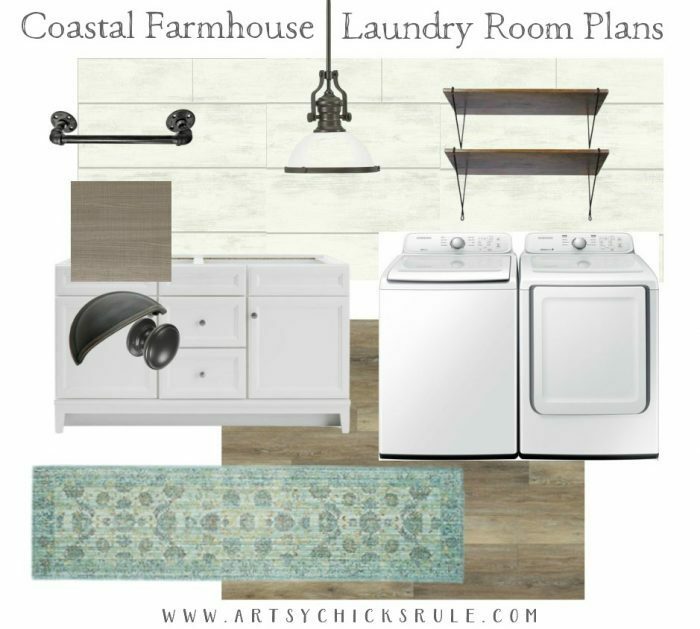 Today I’m sharing the coastal farmhouse laundry plans for it. Have you heard of the ORC? It’s a 6 week challenge started by Linda over at Calling It Home. I can’t believe I’ve never joined in before but am really looking forward to this time. So we’ve got 6 weeks to turn this room around. But hey, I was smart enough to not choose that major overhaul we are doing upstairs for this 6 week challenge! 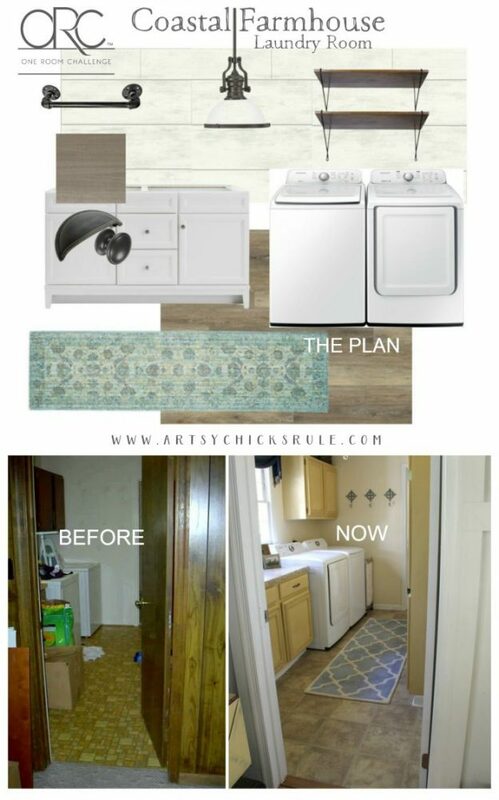 But just look at my Coastal Farmhouse Laundry Plans…..
And this is what it looks like now…..
Not bad but it’s been on the long list for a makeover for quite a while now. And it’s much better than where we started…. …. don’t you think? ;) Yesssss. By the way, please excuse the mess in that old photo. We had literally just moved in and I knew we were updating everything, so I was running around the house snapping photos. SO thankful I did! I did not have a blog yet and that was 13 long years ago. Anyway, a picture is always worth a thousand words, right? You can see that crazy makeover, here. But really, gold and orange linoleum, dark cabinets, gold counter top, etc. 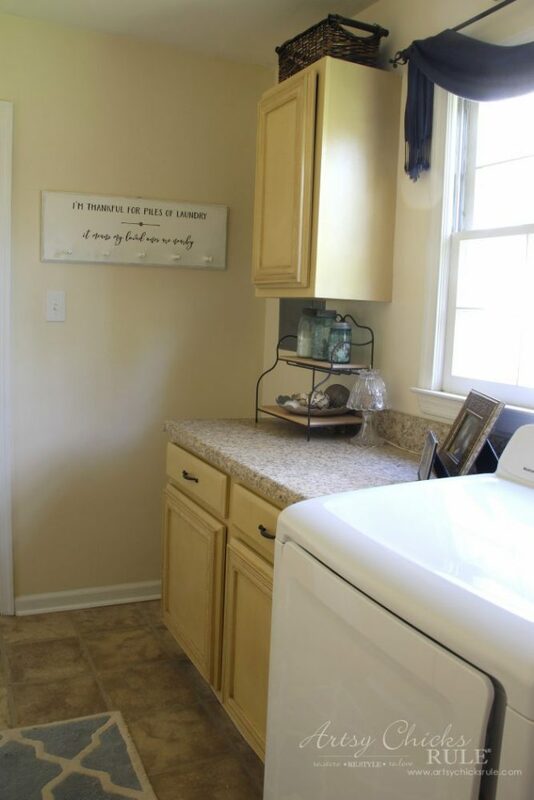 And by the way, those dark wood cabinets in the old photo are the exact same cabinets in the new photo. 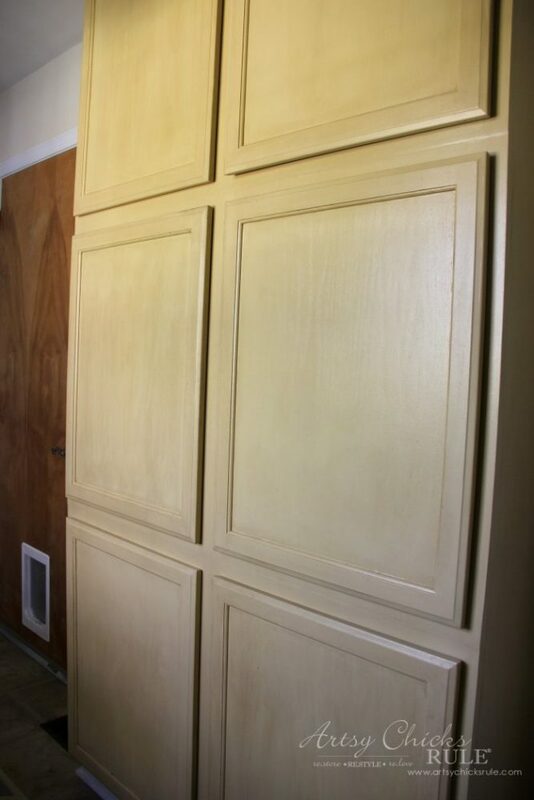 We added decorative wood trim to the plain, flat door fronts just like we did to the kitchen cabinets. Okay, here are the rest of the “before” photos of the soon to be “Coastal Farmhouse Laundry”. Looking directly to the left once you enter is this weird little space. We will be filling this in with a new DIY cabinet. 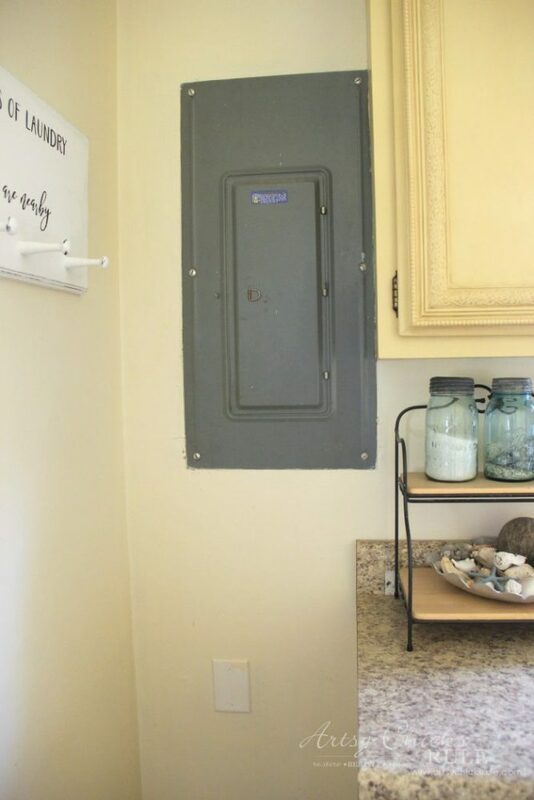 And the electrical box above…. Not too pretty, but necessary. 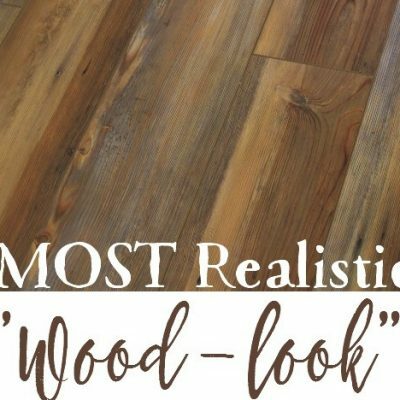 We tried to work through about a million different options, like covering it with the wood and making an “invisible” door to ….we’ll just paint it to match. To the right are some wall cabinets we installed about 10 years ago, floor to ceiling, to create more storage space. We attached 3 sets one on top of the other and use it for extra food, supplies, etc. All of the cabinets are going to be painted white, a nice bright white. General Finishes Snow White to be exact. I also used it recently on my dining room furniture. The flooring was a temporary fix (to cover up that orange/gold stuff) many, many years ago. I think we paid $60 for vinyl tiles that covered the laundry and bath. I never, in a million years, meant for them to stay this long. Not that they are bad, they just weren’t what we wanted for the long run. They’ve actually held up wonderfully. They are going. 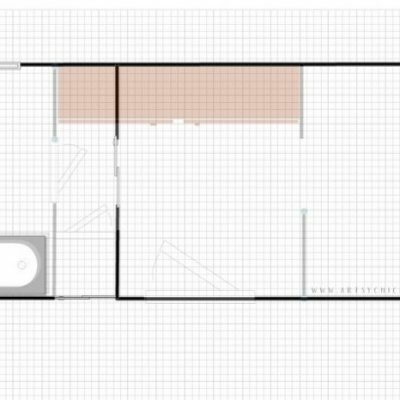 And we are undecided on (I think, subject to change at this point) these 2 floorings, this one and this one. 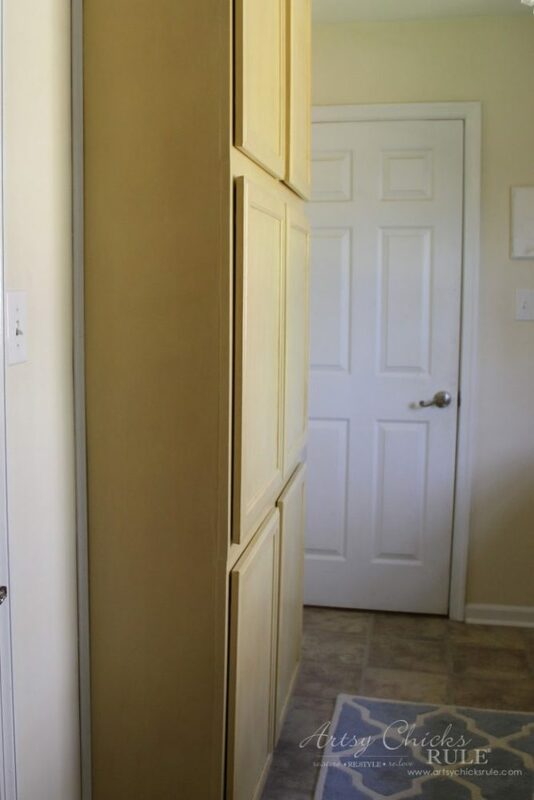 We had to use wall cabinets top to bottom because regular base cabinets would have made the room too tight. I think we will keep the door to the garage but may add trim and definitely give it some paint to match the walls. 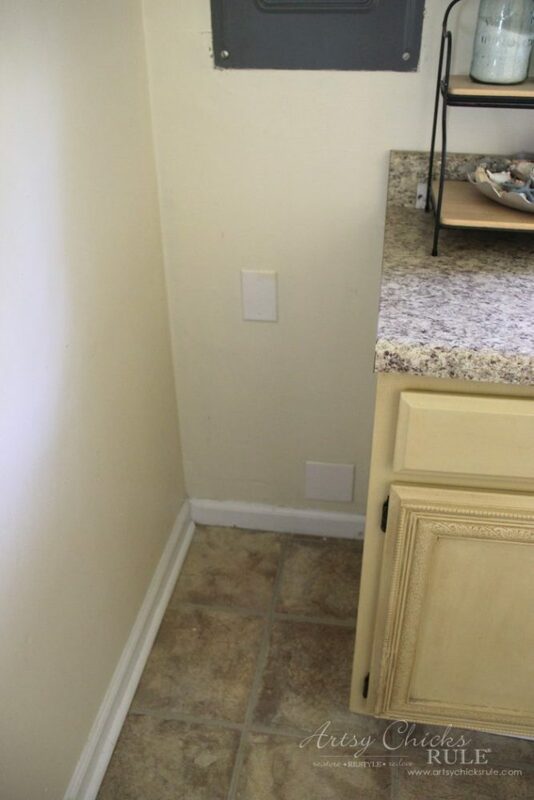 Another view from this angle to show the “wall” cabinets we put here. To the right is this mess…..
We don’t really need a clothes hamper down here so it’s going. But that’s not the mess I’m talking about. 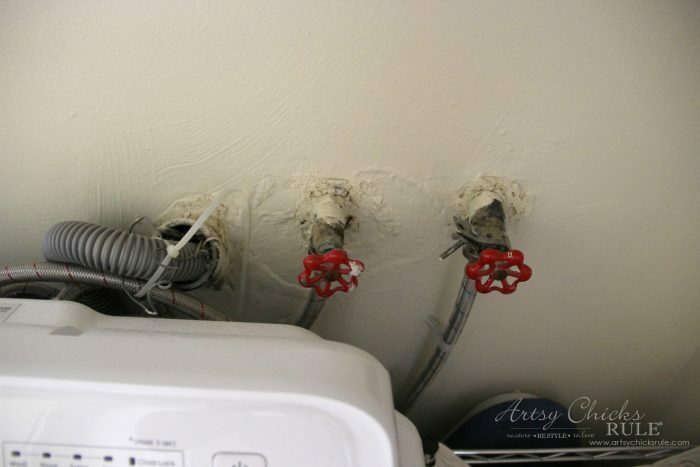 I’m talking about this hot mess…. OH my. I have hated that for forever and a day! Isn’t it awful? And why 2 reds?? 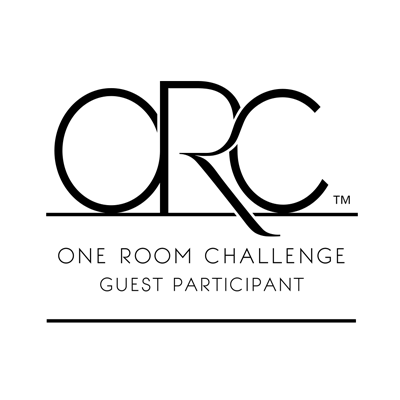 Anyway, that will also be fixed and updated :) Yay! By the way, my husband and I are doing all the work. Anyway, we (as in HE) has done some of the electrical but we have called my cousin over (he owns an electrical company) to do a few things. Other than that, all us. Whew, I’m tired! So the hubby is tackling the box for the valves/drain. 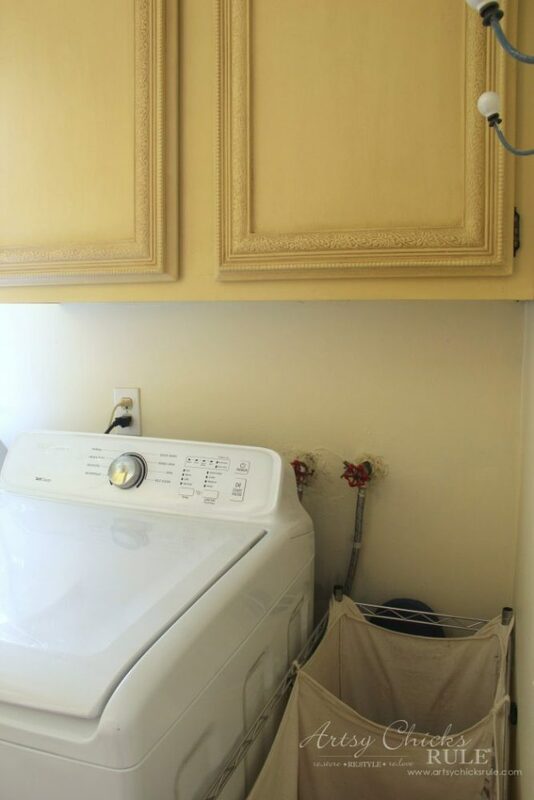 We are planning to put up a couple shelves over the washer/dryer which is getting moved down to the corner. And we are going to install a clothes hanging rod made out of iron pipes where you see the cabinet above. That will be really nice to have in here. The counter top will go all the way to the wall and we are making that out of wood. I will give it a weathered wood/white washed sort of finish, I think. And my favorite thing about the whole room??!! 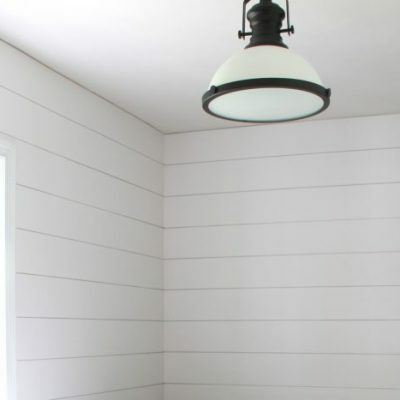 ….. We are going to install shiplap on all the walls. The paint I’ve chosen for it is Behr – Nano White and wow, whites are HARD. I must’ve had 25 different white paint samples….and they all looked different! But Nano White is perfect. It’s a soft, not too bright, white. 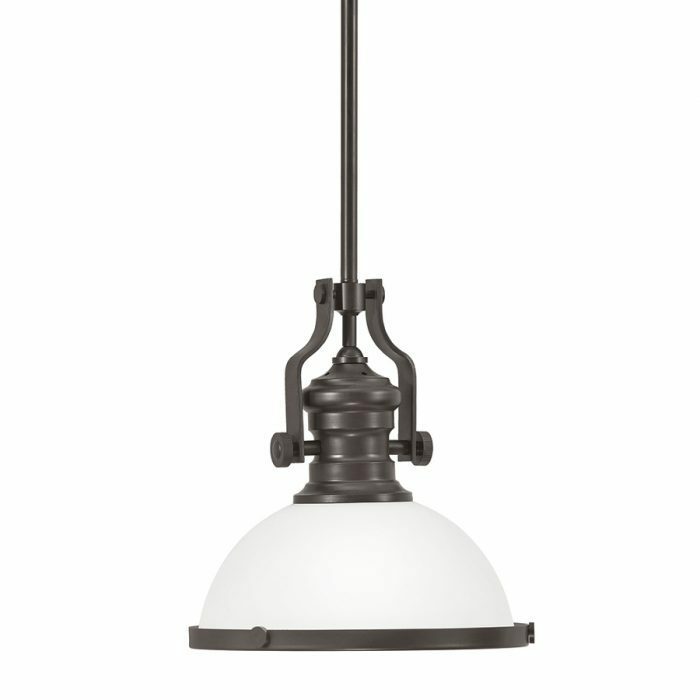 We already purchased our lighting because I loved it and it was on clearance for $31! The chandelier that’s in there now will go up to my master closet. I’d, love (love, love, love!) to find an old office style door that’s half glass at the top. I’d make it frosted and put the words “laundry” or who knows what on it. I haven’t had any luck finding one so we’ll see how that last little detail goes. Be sure to follow along on INSTAGRAM if you don’t already. I’ll be sharing little “in the moment” snippets of progress, I’m sure, in my stories, etc. PIN this for inspiration if you like it…. 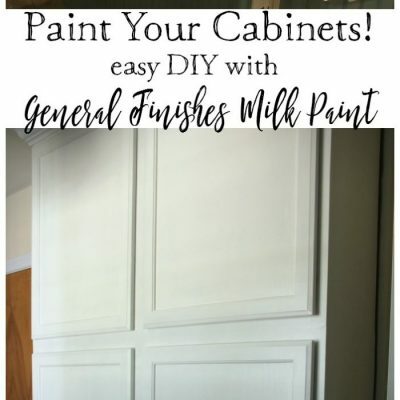 Hop on over to the One Room Challenge linkup to see more makeovers. See you next week with a brand new Trash to Treasure on Tues, I’m doing something cute and inspirational with these…. …and my decorating friends and I will be back on Thursday sharing decorating ideas with windows. Week 1 You are here! You and your hubby done a Wonderful job in your laundry make-over. 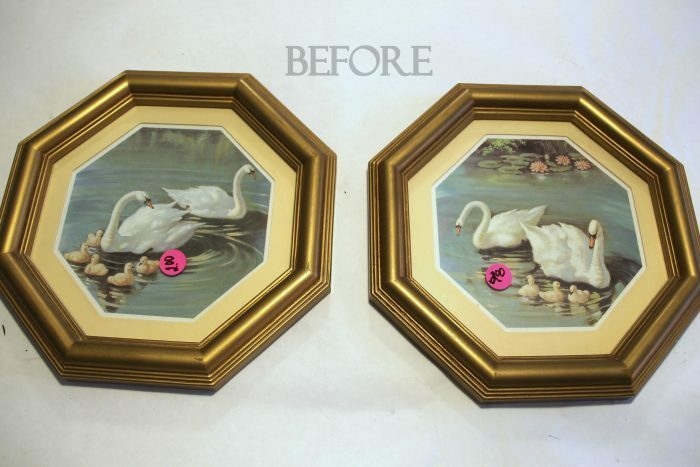 Really Awesome looking..
Oh, I love them framed swan pictures. Can’t wait to see what you will do with them. 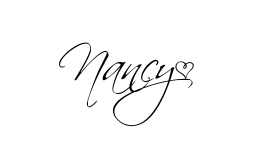 This is so exciting, Nancy! 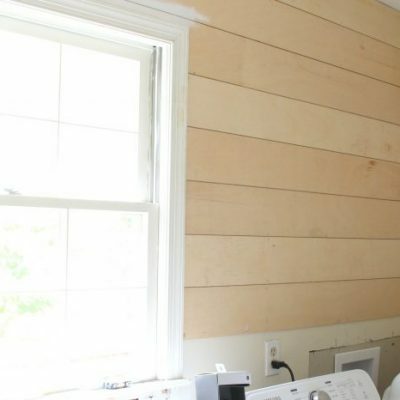 Your laundry room is going to be so pretty when you finish this project. 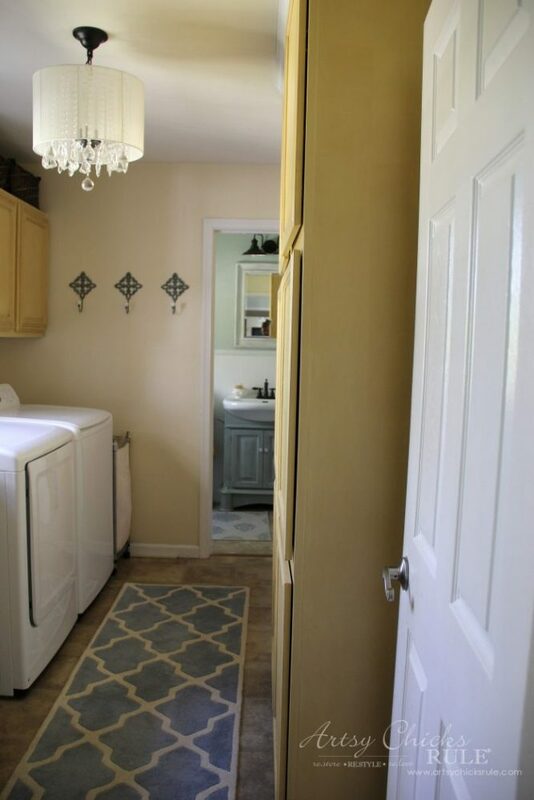 You are lucky to have room in your laundry room for all of those cabinets. If you want to take a road trip (not that you have time), but I’ll be that we could find a door for your laundry at Black Dog in Roanoke. One of my former students also has salvage items in his downtown Lynchburg hardware store and he possibly could have a door. I’ll check if you want me to! This is going to be a great space. The before picture from when you first moved in…OMG. It’s already come a long way and is just going to get better! It is definitely very much improved! Thanks Rose! :) Can’t wait to get it done! 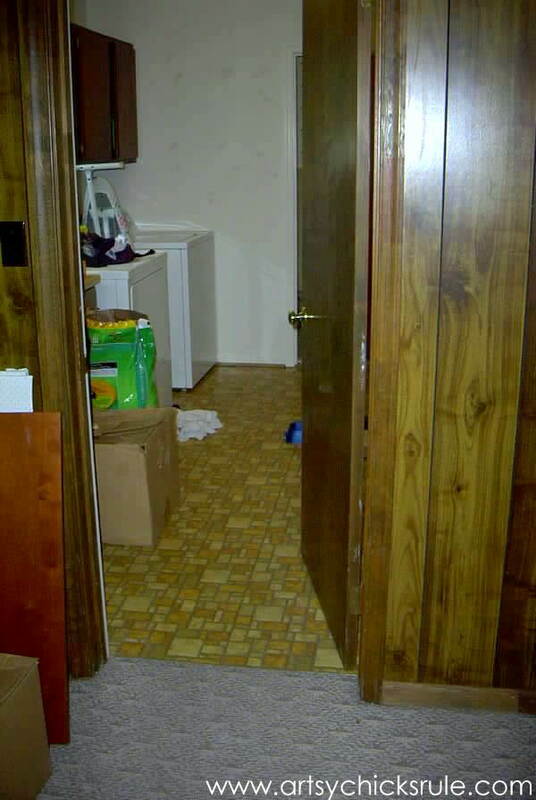 Holy cow, the brown/gold linoleum in the original picture is the EXACT FLOORING that was in the kitchen of the very first house I rented when I was first moved away from home! 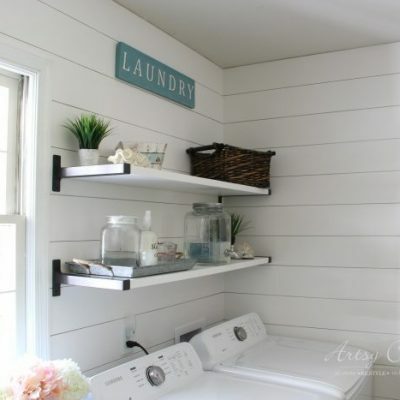 I have laundry room envy. It’s my one big regret that we didn’t make ours a LOT bigger! I feel like I’m in prison in mine. ;) Looking forward to seeing the finished room! Hey Andi!! How are you? !